That man knows how to throw a party! In episode 17, time and money is running out for Kaiji, and the impenetrable block is still refusing every one of his pachinko balls. Meanwhile the game gains an unexpected audience. This is one of those episodes that almost has me wishing Kaiji never gets out of debt — unfortunately this show won’t go on forever, so tune in now before it’s too late! 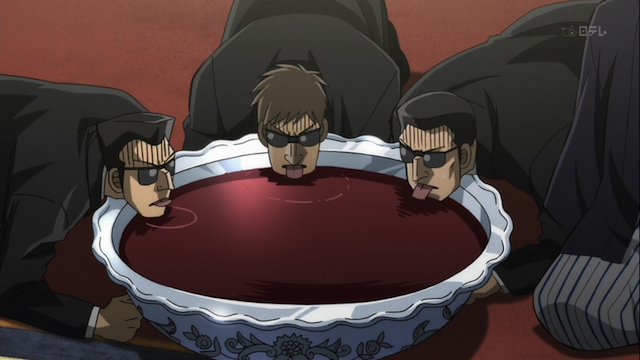 Chairman Hyoudou gets a live feed of Kaiji's game, and has his minions prepare refreshments. Kaiji doesn’t make much progress, instead he loses another 15 million yen, but the stakes get larger and larger as Chairman Hyoudou finally shows his ugly face. The Chairman throws a “watch Kaiji throw his money away” party. After he gets down on all fours and sticks his disgusting face in the silver bowl filled with blood red wine, he exhorts his minions to do the same. When the first minion to accept the invitation, doesn’t sound excited enough Houdou has him killed. Hyoudou's minions quickly learn to submit to his deprived whims with a smile on their faces. 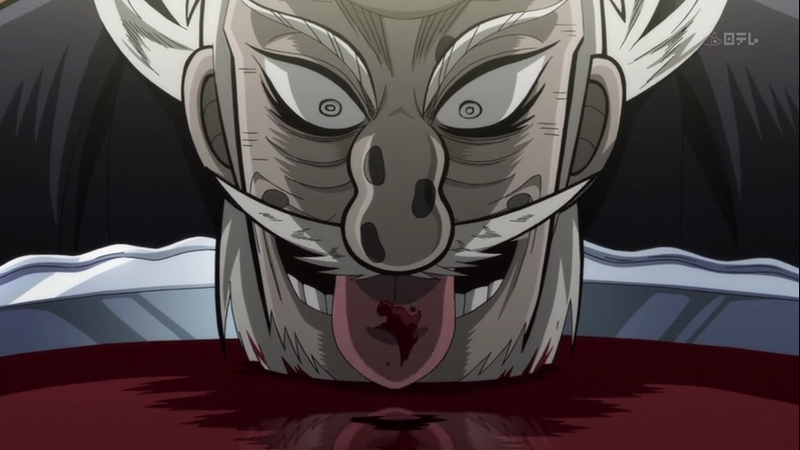 Hyoudou is the ultimate expression of evil. He is disgusting and petty, but everything is going to go his way. In an ideal world Hyoudou wouldn’t exist, but Kaiji isn’t a story about an ideal world, it is about the disgusting reality of human beings. A world in which rising to the top requires stomping on other people’s faces creates depraved monsters who are addicted to power. Hyoudou is one such monster. He already has everything, but he wants to take away even more from the others. Hyoudou watches Kaiji's friends in the pit, who he allows watch Kaiji's futile struggle. 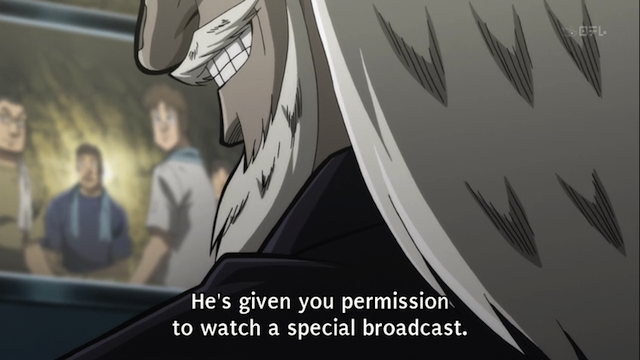 Hyoudou doesn’t just want to watch Kaiji lose, he wants to watch Kaiji’s friends watch Kaiji lose. He takes people who have less than nothing, and gives them something (hope) only so he can take it away. This isn’t about getting more money. The Teiai has so much money that he could let them all go and be unaffected. Even if Kaiji wins, it won’t have a serious effect on Hyoudou. He has too much money to care. He also has so much power that his will is nearly absolute. Objectively he gains NOTHING by crushing those remaining in the pit. They are already dispirited. They already have to suffer every day. Yet Hyoudou wants to crush the already crushed. He wants their broken spirits to break again. Hyoudou’s megalomania knows no limits. At first I thought that Hyoudou making the workers watch Kaiji’s match was a bad idea, since it reassured Team 45 that he was still trying but… yeah, even if Kaiji does win he doesn’t really lose much. It kind of reminds me of the first season when he told Kaiji that even pros like him lose every now and then, and that one loss really won’t hurt him at all. It’s kind of frustrating that even if Kaiji wins, Hyoudou still probably won’t face justice, but I guess that’s not really the kind of show this is. It’s really great to have Hyoudou back, even if he isn’t directly involved with Kaiji and Ichijou’s struggle. He’s just so crazy and evil that he ratchets up the threat just by being in the picture. Hyoudou is an awesome character. I’m glad he’s back too. That’s exactly the point, isn’t it? Very few shows are as dark as Kaiji, because usually the “good guys” win in the end, and that means justice is served. In Kaiji’s universe (dare I say, “as in our own”? ), the bad guys screw everyone over and mostly get away with it. 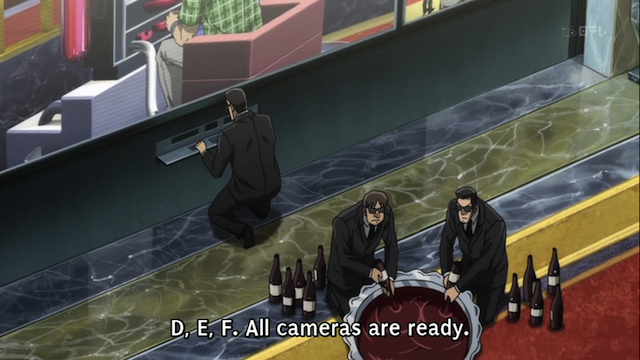 Kaiji can win over the lower-tier bad guys, but look at those guys Hyoudou has lapping up wine on all fours like dogs. Taking Hyoudou down is almost certainly impossible, but Kaiji does have a chance of winning back his freedom.